Paul Walker flies his Predator in Expert Precision Aerobatics the 2015 Jim Walker Memorial Spring Tune-Up in Portland, Ore. Flying Lines photo. The first and and easiest to deal with is simply no air moving in any direction. This usually happens either early in the morning, or late in the day. It also tends to come with a stable high pressure system. Sometimes it also comes with a thick cloud layer keeping the sun's heat from hitting the ground. This condition is flyable, but requires some knowledge of what to do. The second dead air condition is similar to the first but with the addition of variable gusts in variable directions. This creates issues for the pilot in knowing where the wind is coming from. The third dead air condition is similar to the first, but has the added component of thermals coming and going. This condition usually comes with a clear sky and bright sun, and sometimes with a thin high cloud cover. This condition usually happens more towards the midmorning and lasting through the late afternoon. Usually by a few hours before sunset they can diminish. This condition IS the most dangerous condition you can possibly fly in. How do I know this? Back prior to the '84 Nat's, I had built a special Bad News for Reno. It was 725 square inches, and weighed 43 ounces. Now that was light. After the '84 Nat's were over, and I was back in Seattle, it was time for some experimenting. It was running with an OS 45 FSR on an 11.3x4 prop. It was a wood Zinger 12x4 cut down to 11.3. I found this to work well on the Bad News design. But I always experimented with props and got the bright idea to reduce the diameter. 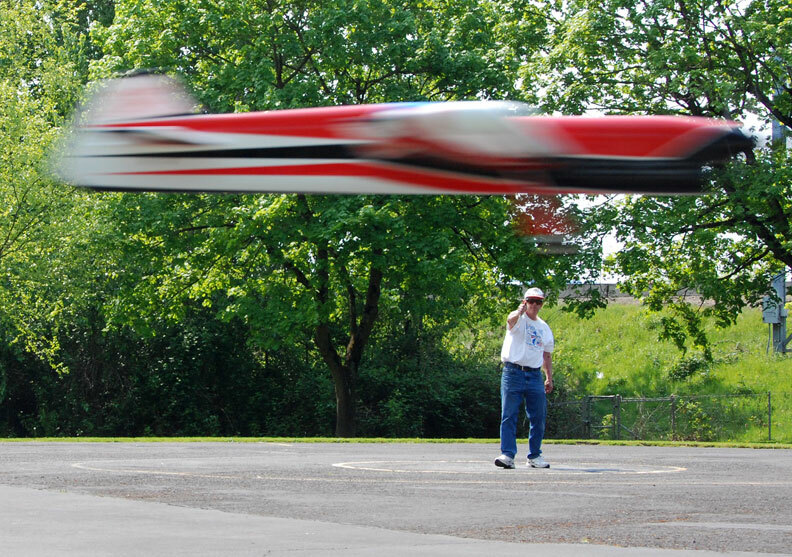 One thing led to another, and I ended up with a 9x4 prop cut from the same Zinger 12x4 blank. I was concerned about how well it would actually work, so I waited for a still day to be safe. After a few flights, I had the lap time set at about 4.7 seconds a lap. I flew it with the 11.3 at about 5.2 seconds a lap, so it was a bit faster. To my surprise, it seemed to take forever to get through the maneuvers, but had adequate line tension and was very controllable. In fact, I thought I had discovered something that was going to change the face of stunt! I kept flying and flying that day enjoying just how well it actually flew. Then the reality of the situation hit me. There was no air moving. How can that be? Stunt planes don't fly well in dead air. I then decided to put on the standard 11.3x4 prop to see how it worked in those conditions. Instantly, I was finding my disturbed air in many maneuvers, and it happened flight to flight. I then switched back to the 9x4 and instantly I didn't hit my disturbed air, and I could stand still for the entire flight. Back to the 11 prop, and back to hitting my disturbed air. I decided to try a 12x4, and without surprise the disturbed air was noticeably worse than the 11.3 prop. To make a long story a bit shorter, I then repeated the experiment a few days later, and got the same results. THEN, I flew it in a 10 mph wind, and was pleasantly surprised how well it worked in the wind until I tried the overhead eight. It would not stay up top with that tiny prop, no matter what I did. Scratch the idea of a 9 prop working in all conditions. But all was not lost, as the concept of smaller diameter prop was hatched for flying in dead air. I repeated the experiment on a more normal size and weight plane. Not to my surprise, the 9 prop would not pull the heavier plane even in the dead air conditions. However, the amount of disturbed air I ran into was a clear function of prop diameter. I didn't try to quantify the amount of disturbed air I was running into versus prop diameter, but qualitatively it was related to the prop diameter. I have flown with 13 diameter props. However, they were always very hard to fly in the dead air as there was always more disturbed air to run into on consecutive maneuvers. I DO know why some like the large diameter props, but I will gladly fly against them in dead air with my tiny 11 prop any day. The '95 Team Trials finals were held in dead air, and more than one pilot wanted to know how I got so lucky as to not have to fly in the dead Aar like they had to. Little did they know that I too flew in the dead air but my 11.3 prop minimized the disturbed air. Bottom line here is that there is a direct correlation between prop diameter and the amount of disturbed air that is left behind. What is the procedure for flying in the first type of dead air? If the air is truly DEAD, with no thermals, it can be flown in easily. In any consecutive maneuver, simply take steps backward so that the plane doesn't fly through its own disturbed air. I take small steps back immediately after starting a consecutive maneuver and carefully monitor how the plane is flying through the maneuver. If you don't back up enough it will become unsettled, the line tension may vary and, the wings may oscillate in the roll axis. If you feel any of these, back up more. This can become an issue with the eights as there is a lot of space where the plane can fly through its disturbed air. Again, the bigger the prop diameter, the more you have to back up to stay in clean air. Remember that there will be judges behind you when you finish and return to level flight. As soon as you have passed the point where there will be disturbed air, quickly return to the center of the circle. In preparation for one of these maneuvers, I will sometimes move to the far side (relative to the judges) of the center pilots' circle before the start of the maneuver to give me just a little more room to back up. Yes, the one obvious issue with flying in the dead air is the overhead eight. You just can't shrink into the ground to avoid the disturbed air. The only thing you can do is to be ready to move quickly if you find the disturbed air and the plane is tossed about. The only thing you can do is, when you start the maneuver, make sure your first overhead is done with your hand held as high as you can, and then move it as low as possible for the second overhead. I can remember a picture of Al Rabe flying an overhead from a long past Nats where he was on his second overhead and his knuckles were almost on the ground. Sometimes these things are necessary. This describes how to survive flying in the dead air. However, you may want everything and thus want to score well in these conditions. The problem with backing up is that each consecutive maneuver will look bigger and bigger to the judges, as the plane is getting closer to them each time around the maneuver. A few simple calculations show only just over a degree of difference, but that translates to nearly a three-foot equivalent growth in maneuver size by the time the maneuver is complete. The judges will perceive this growth. What to do, as you have to back up? It is time for a coach to help you out. Practice making each consecutive maneuver where you have to back smaller from the pilots' perspective to look proper to the judge. It will take a bit of practice, and a good coach to let you know if you made the second or third maneuvers too big or too small. The numbers above are for the round loops, and the eights will appear to grow even bigger as there are four loops instead of three. With some practice, this becomes almost second nature and a scoring opportunity relative to your unpracticed competitors. One last reminder, the smaller the prop diameter, the less you will have to back up, and the less you will have to modify the consecutive maneuvers' sizes. The second type of dead air is similar to the first, but with the addition of light breezes in variable direction. In FAI this is problematic as the judges can only move minimally. In AMA, they can move, but I find that they are usually behind the wind changes and still have an incorrect view of the maneuver. The best bet is to position the judges and fly in front of them, regardless of what happens. The problem now becomes one of deciding where to position the judges, and where the wind is and where it might move to. Usually, during the competition in these types of conditions, I will watch closely for several flights before my flight is scheduled and see what variation there is in the wind direction. Based on that, I decide where to place the judges. The first variable wind direction is simple and obvious as to what to do. That direction is the wind at your back. In this condition, it is possible that you will not have to back up. Sometimes I will back up, just in case I overestimate the wind speed, and its ability to clear the disturbed air by the second consecutive maneuver. After a few maneuvers you will get a feel as to how much you need to back up in each maneuver. If the wind continues in this direction, consider yourself lucky. Now, if the wind changes and is in your face, backing up is exactly what you do NOT want to do. If you back up at the same speed as the wind, it will be like not backing up in dead air. The disturbed air will move with the wind, and you can easily find it even after backing up! What you want to do is one or the other: walk toward the maneuver to find clean air if the air is light, or if the air is moving enough stand still and let the wind clear the disturbed air naturally. Either is not easy to do, as it will decrease your line tension in the process and you then have to grow the maneuver if you walk into the maneuver to keep it looking correct to the judges. The problem in all cases is estimating just how much air there is and deciding on a course of action. The other case is where the wind changes direction and blows on your side. Again, you will need to back up some, as the disturbed air will move but will remain in the path of the plane. The line tension during maneuvers with this side wind is not much changed, but will feel different in maneuvers as it will have a headwind in half of the eights and a tail wind in the other half. This changes its pitch response in corners, and some in the rounds. You must be aware of this prior to the maneuver so you can make proper control inputs to make proper shapes instead of just responding to the conditions. A side wind is not that hard to fly in, and if you find an occasion to practice this, do so with a positive attitude. This without question is absolutely, positively my least favorite type of condition to fly in. Dead air with thermals is just plain dangerous. This is truly a reactionary situation, as a thermal can come upon you instantly without warning. Yes, there are times when you can feel it coming. This can be felt as a bump in level flight that wasn't there the last time around. You can also be in the middle of a maneuver and all of a sudden the plane can be tossed about like it had no mass. It can be pitched, yawed, or rolled violently depending how it intersects the thermal. Sometimes it can even help you. I have had several flights where I found a thermal in the vertical eight and it pushed the plane up to the top making the first half very easy, and on the way down from the top it had to work hard to come down. I wish I had that problem on every flight! If a thermal happens in a scoring flight, you just have to do your best to continue through it. As mentioned earlier, I watch flights prior to mine to check out the weather. If there is any chance this thermal event can happen, I will add some extra time in the timer, or put more fuel in the tank to give me the option of doing multiple level laps to wait out a thermal. It's better to avoid the thermal than try to muscle through it. I wish there was more I could do to help here, but there is virtually no way to prepare for it, and it becomes totally reactionary. In summary, use as small a diameter a prop as you can get away with for the dead air. Practice backing up at various speeds to get used to the process of backing up and flying maneuvers. Also consider a coach to help you with maneuver sizes from a judges' perspective when backing up. Practice in these conditions will help in future competition flights when dead air might surface.